January was a bit of a drag but February was a busy month and March is almost over. F.A.W.M monopolized most of my February creative time but I worked in the shop too. I cut out some small snowflakes, peace signs, and stars.I tried to rearrange parts of my workshop, unfortunately with limited success. I had an ETSY special order for a wall hanging, well it would have to stand on an easel not a wall hanging, but you know what I mean. 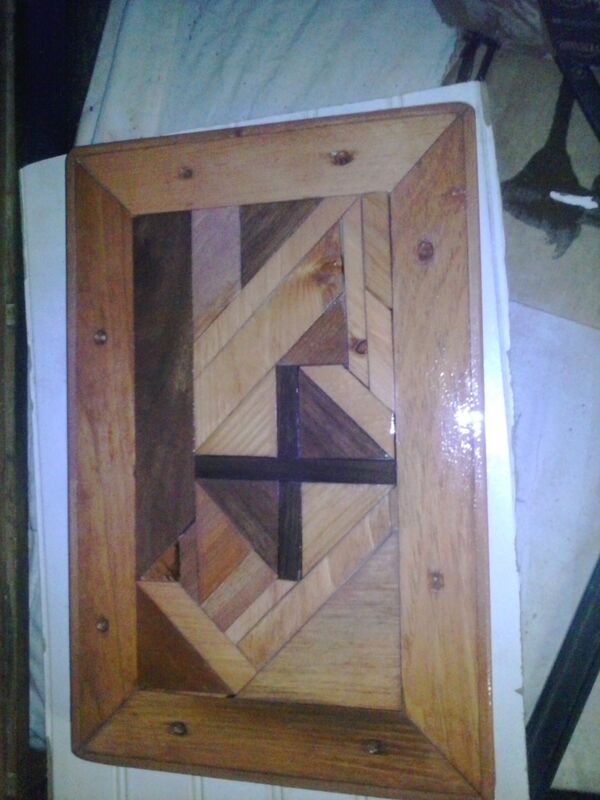 It was suppose to be Celtic inspired and use more natural wood and little to no painted scraps. I wanted to post pictures of the order but it was a birthday present for a person who follows my shop. I did not want to risk posting about it and having the recipient see. I experimented with shapes on the special order and I think I am going to mix up my pattern execution and be less rigid in terms of shape structure. I am making some progress sanding my shutters down to get the flaking latex paint off the oil paint. Once that is done I will put a clear coat on them prevent the rest of the paint from flaking. That should be the end of the prep work, I am very excited to move on to the construction phase of the shutter shelf project. That’s it for now, and if you can correctly guess the origin of the tittle of this post you get 10% off your next purchase in my etsy store! 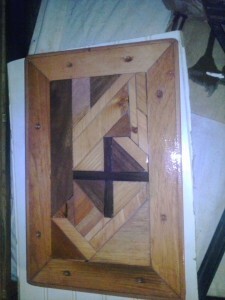 This entry was posted in barn board, fairs and shows, fawm, old projects, scrap wood by brighid. Bookmark the permalink.